REGISTER FOR ALL STAR TRYOUTS USING PARENT PORTAL ON MENU BAR! Like us on facebook!Share with us on google! Spirit All Stars (SAS) takes recreational cheer to the next level! SAS is offered for children ages 5 to 18. This program is for the extreme athlete that wants more then recreational cheer has to offer. Our full season All Star teams are year round programs and all routines are professionally choreographed and our teams are coached by USASF certified coaches. 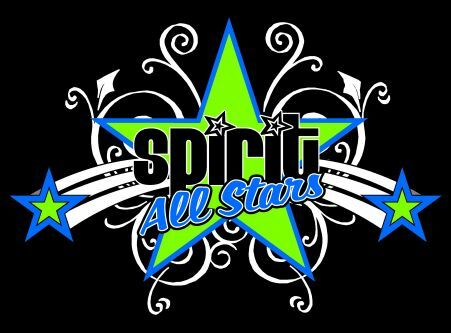 Spirit All Stars compete against all star teams from all over the US but most competitions are right here in Illinois! SAS currently holds numerous National titles and have also won outstanding coaches' awards, choreography awards and sportsmanship awards! In 2016-17 we will have 2 possibly 4 out of state competitions most within driving distance. SAS shares the Spirit Cheerleading's values you have come to love by teaching cheerleading techniques in a fun and safe environment. However, these teams will practice more hours per week then our recreational cheer. Levels 1-2 will practice 4 hours per week and Levels 3-4 will practice 5 hours per week. All of our cheer programs include difficult stunting, tumbling and require much more dedication and commitment then rec cheer. These teams compete at approximately 10 all star competitions per year and may qualifying to attend The Summit in Florida. All Star Prep Teams!!! These cheer teams will practice 3-3.5 hours per week and will attend 4 all star competitions and exhibition at our in-house rec cheer competition in December. These teams are for those athlete's that participate in other sports and cannot dedicate as much time to cheer or dance. The fees are much more cost effective then full season all star but still allows for the all star atmosphere and all star competitions. A perfrect middle between rec cheer and full season all star cheer. If you are interested in our Prep Teams your child should attend try-outs in May or call for an personal evaluation. It's preferred that cheerleaders start in May but you may join up until mid-September. If you think your child has what it takes to be an All Star we invite your child to a personal evaluation. You can register for this by going to the bottom of this page and creating an account. The 2017-18 tryout fee is $35. Upon making an All Star team a non-refundable deposit towards your All Star fees is required. Monthly payment options and pre-pay discounts are available. For more information or for a copy of our 2017-2018 All Star Info Packet please contact Kristy at kristy@spiritcheerleading.org or call the gym @ 630-882-9413! Team Energy ~ (6 yrs and under) - No Tryout Required must be at least 3 yrs old. Program ran similar to Rec Cheer with performances at the Spirit Competitions. Registration for Team Energy is available by clicking REGISTER on the home page or under Recreational Cheer for online registration during any open registration period. Practices for Team Energy begin in September and run through May and are held at the Spirit Facility located at 125 Boombah Blvd. (formerly W. Wheaton Av.). For more information about our Tiny team - please refer to our Recreational Cheer Page.